At this time of year -- from Thanksgiving through Christmas -- I just can't get enough of tangy cranberries and sweet oranges. The combination of these fruits is so traditionally festive to me and since I've watched Kenya down an entire cup of cranberry sauce in one sitting on more then one occasion, I knew he would love this bread. 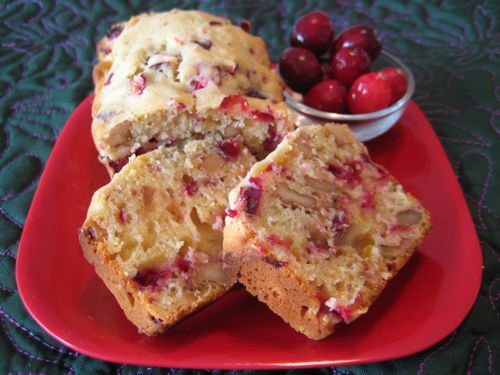 The other thing I love about this cranberry orange nut bread is that it is full of fruit and protein and has NO refined sugar, so you won't feel guilty letting the little ones dig in as much as they like. I decided to make mini loaves so I could give them to friends as holiday gifts, but you could just as easily cook it in a single 9 x 5 inch pan and enjoy the entire loaf at home with your family! 2. Combine the flour, baking powder and salt in a bowl. 3. Cream the butter and agave and then add the orange juice, egg, vanilla and orange zest. 4. Pour the flour into the butter mixture to combine. Add the cranberries and walnut. Do not over mix. 5. Pour mixture into a 9×5 inch greased loaf pan or 6 greased individual mini loaves. 6. Bake 55-60 minutes for the 9×5 inch pan or 35 minutes for the smaller loaves. 7. Let rest for 5 minutes in the pan, remove and cool or a wire rack. have you tried this as a mini muffin? how long would you bake it? Is there an easier way to chop the cranberries than with a knife? I don't think I made them small enough. Do you use a food processor? They were very good. Thank you! You can just cut them in half if they are small but if they are too big, i would cut them down smaller. I would cut them in half first then start chopping, that way they dont roll around everywhere. You can put them in the food processor but don't pulse it too much, just a few times would be good. I used a food processor for both the cranberries and walnuts. It turned out beautiful, even though the cranberries were very tiny...the flavor spread through the entire bread. can you eat cranberries raw? I made this bread for Christmas morning. It was simply amazing! I'd love a way to bring the amount of sugar down...but no one in my family complained! Definitely a new holiday \"must have\"! I am personally not a big fan of walnuts what would be the best substitute in this recipe for nuts? Yes! Maybe use 1/2 a cup because they will be way sweeter! I made these for thankgiving and for some reason the bread didn't rise. I followed the recipe exact. And reason why this could be? Hi! I have made these the last 2 Christmases and they are so good, but each time I end up with little patches throughout that instead of a bread consistency are kinda mushy. I am worried it's underdone, but I have tried baking it 10-20 min longer and still get the same result. Any idea what would cause this? Looks delicious! Could you substitute white whole wheat or whole wheat flour in this recipe? I haven't tested it, but it should work just fine! It might be a little more dense and nutty!